Statue o Aryabhata on the grunds o IUCAA, Pune. As thare is no kent information regardin his appearance, ony image o Aryabhata oreeginates frae an airtist's conception. 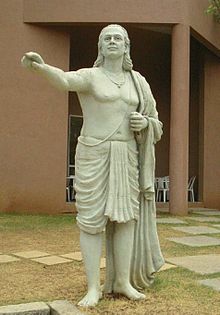 Aryabhata (Sanskrit: आर्यभट; IAST: Āryabhaṭa) or Aryabhata I (476–550 CE) wis the first in the line o great mathematician-astronomers frae the classical age o Indian mathematics an Indian astronomy.